This rare fawn full Accoyo male can launch your breeding program into orbit! 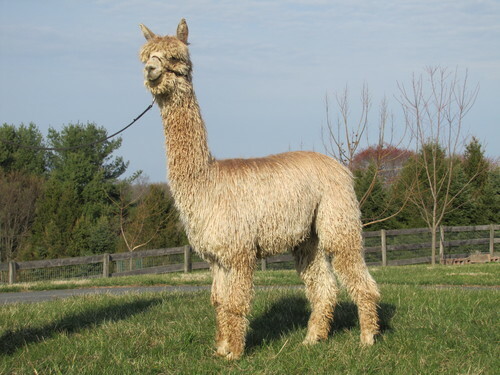 Apocalypse's female siblings have all produced medium fawn full Accoyo offspring, such as Full Accoyo Diosa owned by Lazy G Alpaca Ranch and Toni's Accoyo Golden Perfection owned by Dr. Toni Cotton of Suris of the Western Slope, even when bred to white males. Apocalypse's sire and dam are both fawn in color, heavy boned, and have tremendous density. 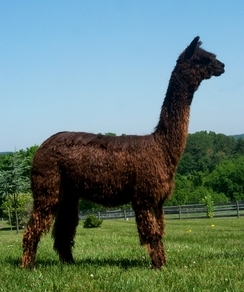 Apocalypse's 1st cria, Fox Run's Solaris by Apocalypse, looks just like his dad with dense, high luster fleece. Solaris was Reserve Champion at the 2009 Phoenix Show at 6 mos of age, and then won Fawn Color Champion at the Suri Network All Suri Fleece Show in August! Apocalypse's 2nd cria is an multi colored appaloosa grey, WRSR Peruvian Kamikaze, out of a white dam with grey on her face. Kamikaze is an appaloosa/pinto fancy with high luster, and slick uniform locks. He also has a white full Accoyo daughter, Accoyo Jakarta, and a medium fawn vicuna patterned daughter, Butterscotch. Lots of girls! WRSR Brigitte by Apocalypse was awarded MAPACA Fleece Light Color champion in 2011. Lots of girls, lots of champions! Apocalypse has swept the fleece shows, and won the AFCNA "Spirit of the Fiber Industry Award" for Best Suri at the 2006 AOBA National Conference, plus many other awards. He won Light Color Champion at the 2007 Denver GWAS Show in his amazing 3rd fleece, soaring ahead of white juveniles and yearlings! 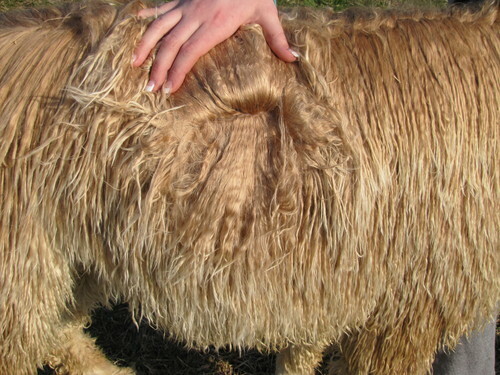 His fleece is amazing - check out his awards and consider him for your breeding program. Apocalypse sheared 8.7 lbs for 12 months growth in 2008! He just keeps getting better and better each year. This is a rare opportunity to breed to exceptional and rare sought-after genetics out of the Bruxo line and an unrelated Accoyo import dam. 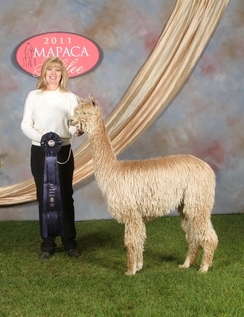 Get some fiber awards for yourself from his crias! After all when all is said and done, it's all about the fiber! 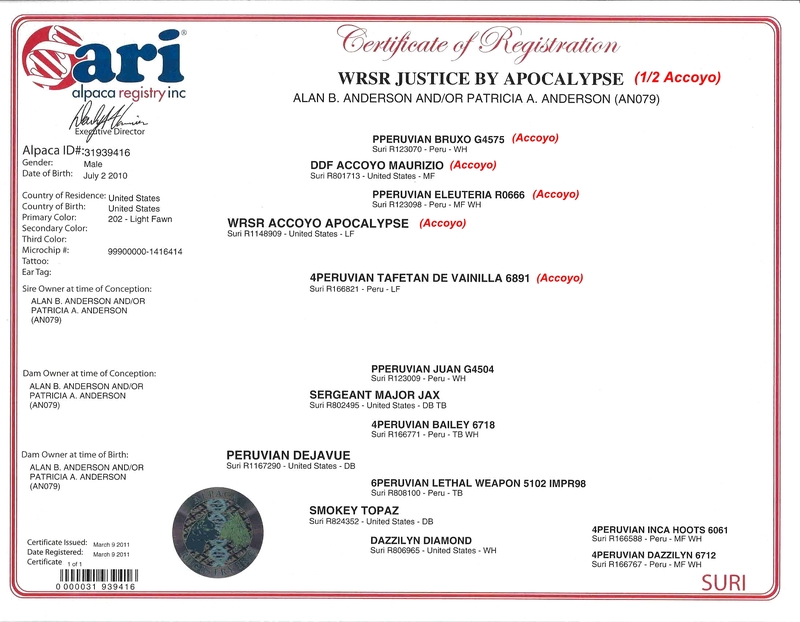 We purchased Dejavue because of her intense dark brown color, combined with high luster and density. She shears almost 4 lb blankets each year of the darkest chocolate brown uniform color you've ever seen. Her sire is the well-known Sergeant Major Jax (DB) and her dam is Smokey Topaz, a dark brown Lethal Weapon daughter. Justice has one of the silkiest fleeces you will ever handle, and lots of it! He is shearing 7.5 lbs of fiber annually, all uniform, and all high luster. His AFD at 4 years old is a mere 25.0, and he has wonderful density. His dam, Dejavue, is a Seargant Major Jax daughter exhibiting that rich dark chocolate color of her sire. She retains her fineness and is one of the most lustrous females on the farm. His sire, WRSR Accoyo Apocalypse, is a 2nd generation fawn full Accoyo with fineness and loads of fiber. Apocalypse is a champion, and even received a championship in his 3rd Fleece at a Level 5 halter show. 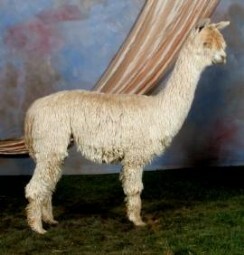 He has won numerous ribbons in the top 3 for his fleece in the fleece shows, as well. Justice is now proven, and his first cria was born in August 2014, WRSR Lockdown by Justice, a high luster, slick medium fawn male. 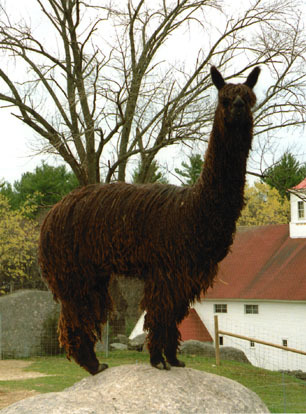 He was bred to WRSR Peruvian Maelstrom's Mirage, a medium fawn champion daughter of multi-champion WRSR Peruvian Maelstrom. Lockdown (now sold) has the same great, easy-going disposition as his sire. Justice settled on his first try, and is a potent male. He has a great calm disposition and is easy to handle. Justice is also available for breeding and is VERY ready to breed. He is related to many of our females through his sire, Accoyo Apocalypse, which limits his use here on the farm. 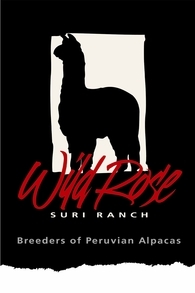 He a nice, gentle male with excellent density, luster, and high shear weights, all traits he has passed to his cria. Get some great density and luster genetics with a breeding or purchase of this new male.